Come for art lessons, crafts, music, and more! 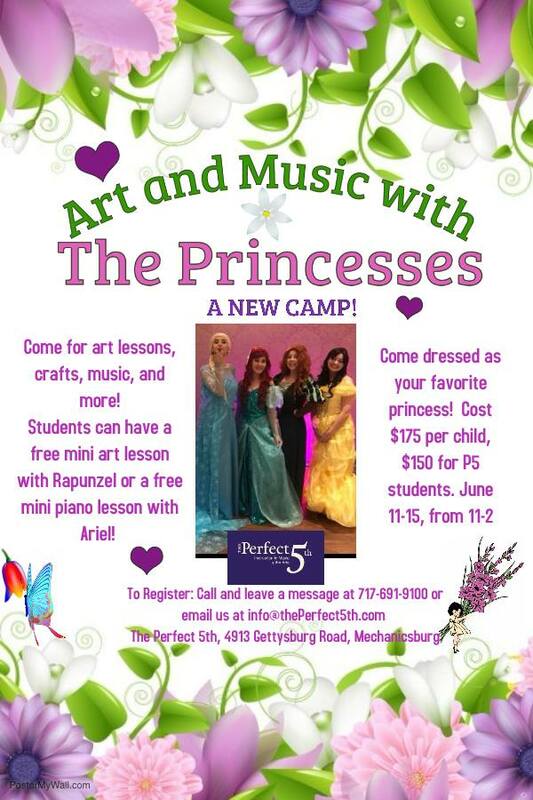 Students can have a free mini art lesson with Rapunzel or a free mini piano lesson with Ariel! Come dressed as your favorite princess! Please call (717) 691-9100 to register and leave a message, as we are usually teaching! The instructor will contact you get your child registered or answer any questions you might have. The Perfect 5th Musical Arts Center has collected some of the best music, art and acting instructors in Harrisburg, Mechanicsburg, Camp Hill, Carlisle, New Cumberland, Lemoyne, Dillsburg, Enola, and the West Shore, Pennsylvania area. We offer group and individual lessons in Acoustic & Electric Guitar, Bass guitar, Piano & Keyboard, Voice, Drums & Percussion, Flute and more. Live music events such as concerts, recitals, jam sessions performed by local bands & musicians as well as famous artists are the type of events you can find at our music arts center, in Mechanicsburg, PA. We also offer educational events for seasoned students to learn from well known musicians in our artist clinics and master classes. We now also offer high quality art and acting programs at The Perfect 5th.